I have received an inquiry from a reader, in regards to Knock Out Roses. 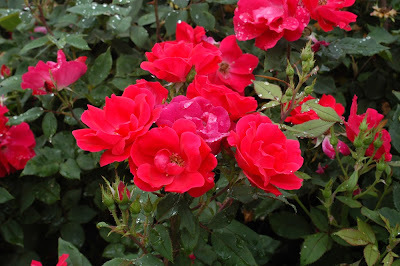 I do not have any roses of any kind in my garden right now, but after reading that these are considered easy to grow, and that they are adaptable to full sun or partial shade, I am thinking of maybe adding some to my garden! Check out this hedge! Now that would make the paper boy think twice before hopping over it! What a beautiful garden! 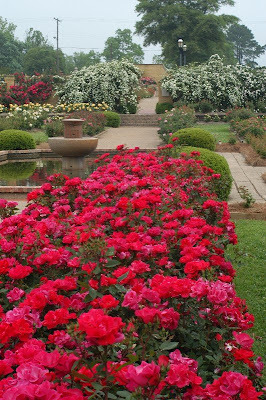 Knock Out roses were developed by William Radler, a Wisconsin botanist who was looking for a hardy, disease-resistant rose bush. 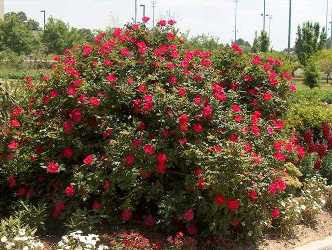 Knock Out roses are a shrub rose bush that grows to about 3 feet in height and stays in a relatively tidy mound. Proper care will keep this rose bush blooming late into the fall. Step1: Cut the Knock Out rose bush down to approximately 12 inches in early spring, using a handheld pruner. Step2: Shape the Knock Out rose bush during the growing season. Keep the mound as rounded as possible. Trim any branches that are growing faster than others. Step3: Remove faded blooms by deadheading to encourage new growth. 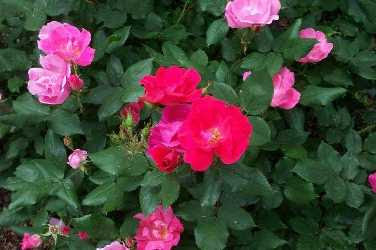 Regular deadheading will keep the Knock Out rose bush blooming until late fall. Unlike most roses, KNOCK OUT will grow very well in part shade locations with excellent disease resistance. Water deeply and regularly (mornings are best). Avoid overhead watering. Good air circulation promotes vigorous and healthy growth and helps control foliar diseases. Summer mulch helps retain moisture, keeps roots cool and discourages weeds. Remove spent flowers to encourage rebloom. Crowns may need winter protection in cold winter areas such as St. Louis. Remove and destroy diseased leaves from plants, as necessary, and remove dead leaves from the ground around the plants both during the growing season and in the fall. Prune as needed in late winter to early spring. 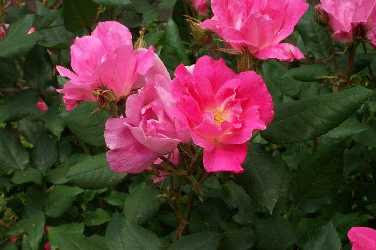 Roses are susceptible to a large number of diseases, the most common of which are black spot, powdery mildew and rust. Good cultural practices are the first line of defense in disease control, but regular preventative fungicide applications throughout the growing season are often required, especially if you are living in a humid climate with regular rainfall such as the St. Louis area. The good news is that KNOCK OUT has excellent resistance to the these diseases, and often does not need regular fungicide treatments. Potential insect problems include aphids, beetles, borers, scale, thrips, rose midges, leafhoppers and spider mites. I do hope this information will help you figure it out! Be patient...as long as it is not brown and crunchy....you still have hope! *)*)*) to those special three...Admitting your mistakes is not a sign of weakness but a sign of maturity.